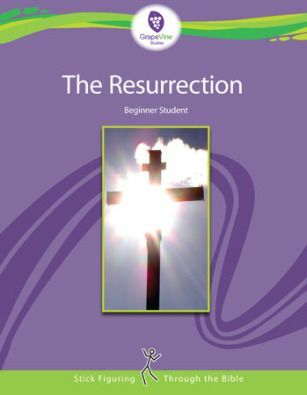 The Resurrection study covers the time period from The Last Supper in the Upper Room until Christ’s Ascension into Heaven. There are 11 lessons to be done weekly or you can break them up into 22 daily lessons. The weekly lesson schedule is perfect for co-operative settings or in a religious education program and expects the lesson to be completed in under an hour. 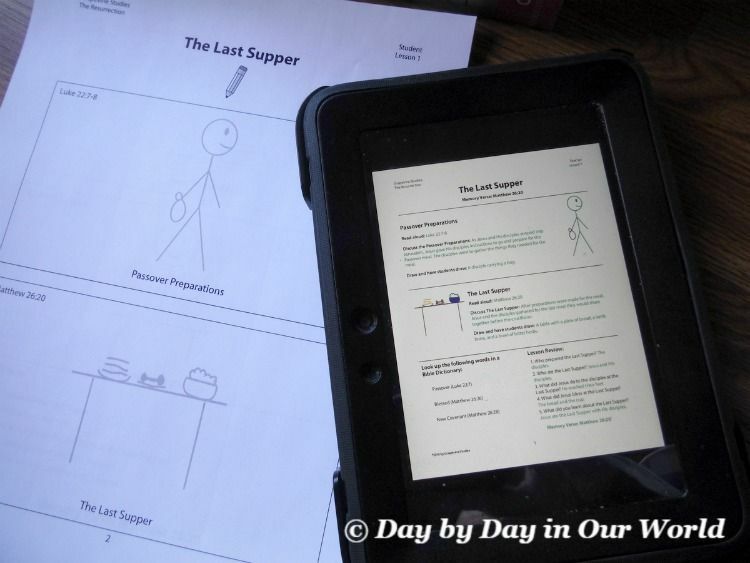 The daily lessons are written with a homeschool family in mind, although you could also use it as a nightly devotional as a family with the total time to complete being around 15 minutes. 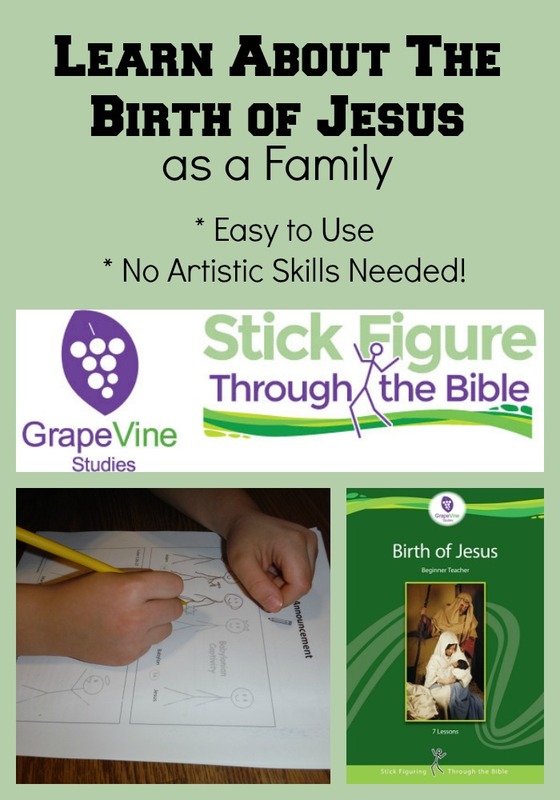 You can order the units from Grapevine Studies in either an ebook format or printed. The ebook is sold with licensing by family or for a classroom. 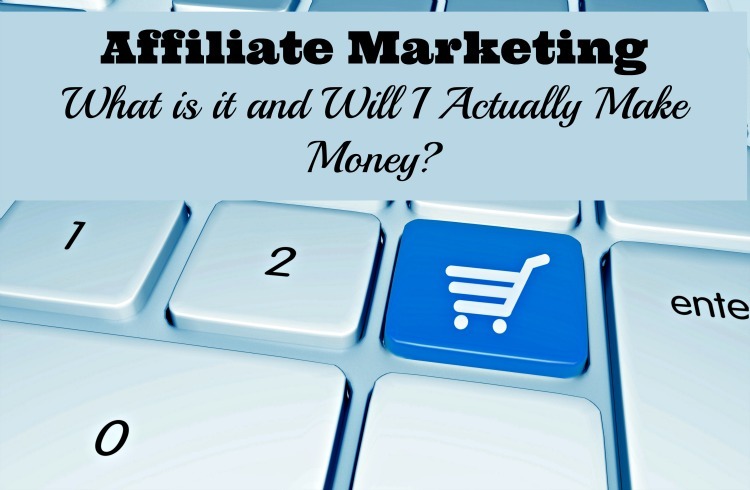 We received the ebook which works great for me to print the pages I want when I need them. 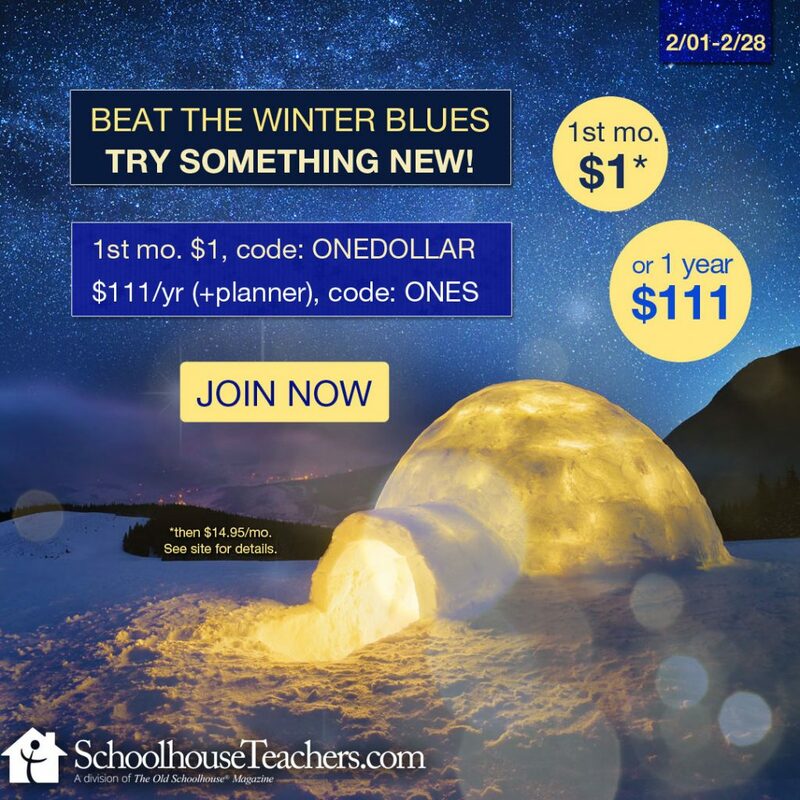 To make use of this study, you need both the student pages and the teacher resource guide. The student pages for this level are offered in a traceable format for those kids who might be too ‘stuck’ on what to draw and prefer to trace and embellish the basic stick figures. 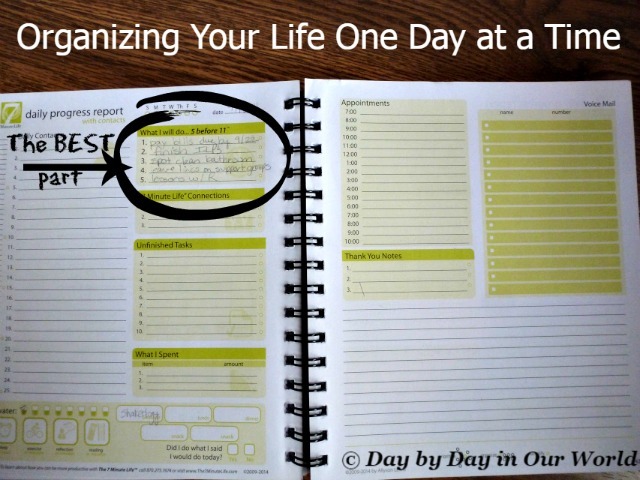 Lesson plan pdfs by week or day can be purchased separately to help you keep on track with little effort. Other supplies are colored pencils, a dry-erase board (for the teacher to demonstrate stick figure illustration) and a Bible dictionary. Ever since I was introduced to Grapevine Studies several years ago when we reviewed, I was hooked. 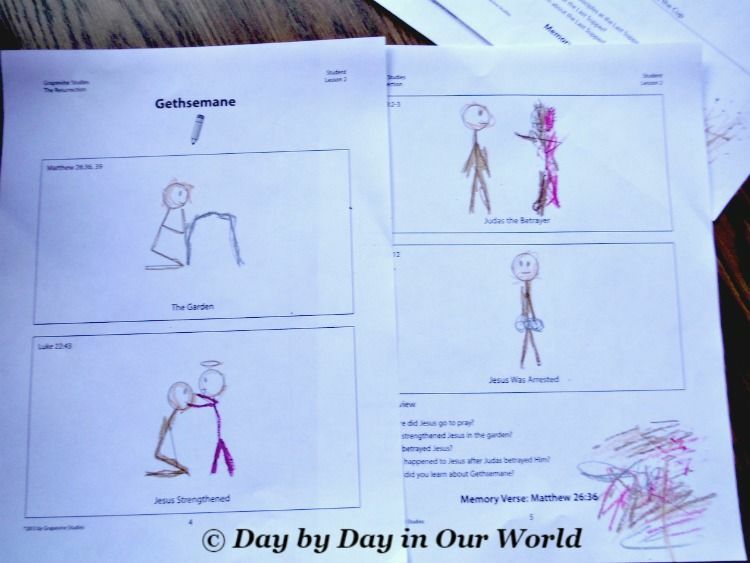 Drawing scenes from Scripture can help to solidify the verses in your memory. 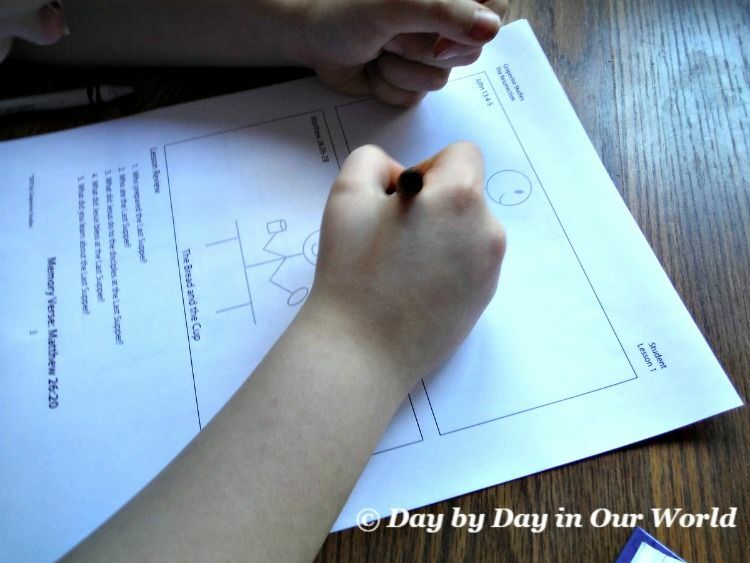 Being told to draw stick figures means this less than artistic homeschool mama can draw away with no fear of ridicule. Of course, the same freedom is afforded my boys especially the youngest when he uses the traceable pages instead of staring at a blank box. Another component I really enjoy is the inclusion of memory verses. Sadly, the skill of memorization seems to be downplayed not only in regular schools but in our parish’s religious education programs. 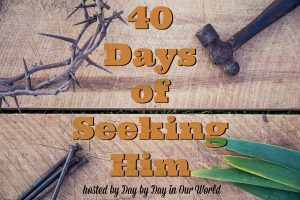 Scripture verses can be a wonderful touchpoint to remember how we should be living when the world conveys messages diametrically opposed to God’s plan. 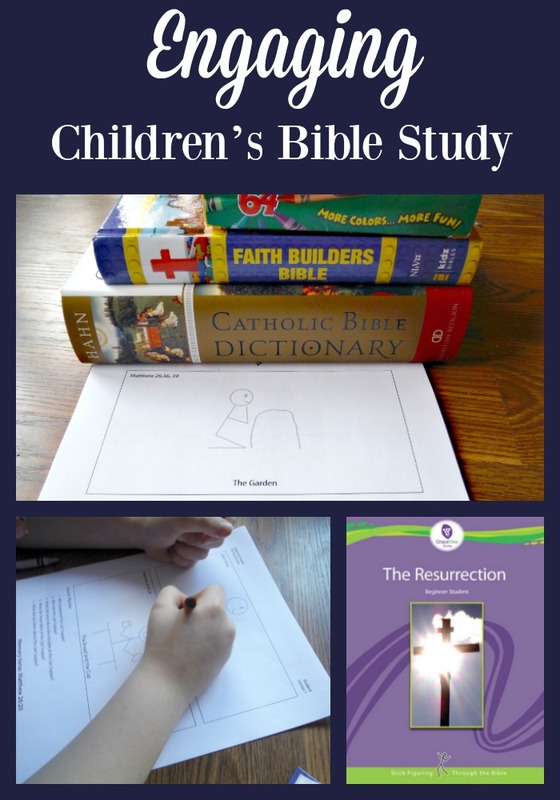 Using the Children’s Bible Study on The Resurrection has reminded me (again) that I need to include more memorization for my boys, especially the younger ones who have years of formation ahead of them. For those reading this review and wondering about how the Bible study will fit your particular denomination, rest assured that it will work. Scripture is referenced by book and verse and not given for a particular translation of the Bible. This means you can use whichever Bible you have in the house (or online) that you want to use with your children. 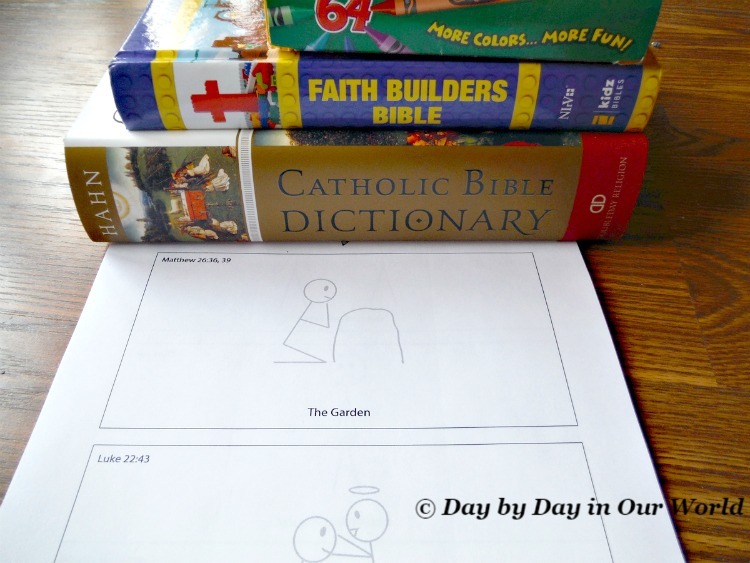 Overall, this has been a delightful and easy Children’s Bible Study to implement in the house. My youngest son loves to spend time in The Word learning more about our past. I’ve found that we sometimes read just a bit more of Scripture than the verses mentioned in the study. 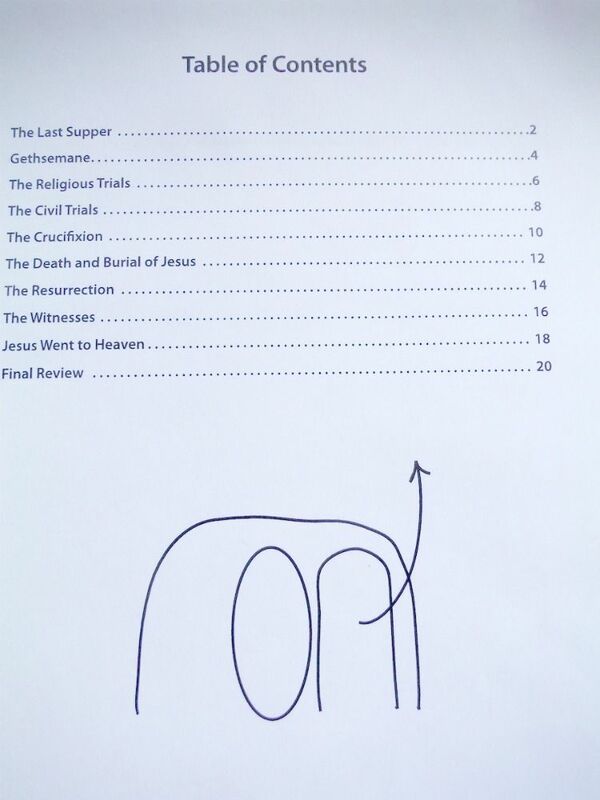 It is definitely a great way to prepare for Easter. Don’t just take my word for how we found this to be. 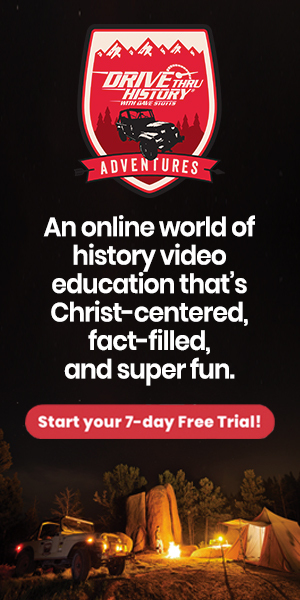 Visit Grapevine Studies post on the Schoolhouse Review Crew website to see what other homeschooling parents thought about this and other self-paced courses. "Scripture verses can be a wonderful touchpoint to remember how we should be living when the world conveys messages diametrically opposed to God’s plan." --I love this! So very true. Just today, I told one of my kids, "The Bible tells us, 'As much as it depends upon you, be at peace with all men.' " I'm grateful for the verses that I tucked away during my years of Christian school and Sunday school.